For my part I think the debate should be about keeping as many teachers in their classrooms as possible given budgetary constraints. Strange I know but I've always been a bit of an odd duck. Watching the budget protests by teachers in Wisconsin over the last week I have to say I am not at all impressed. It seems like a really simple thing to me, your state is broke and looking to save some money. Government officials looking at the education budget. I would if I were in their shoes. No one wants to lose teachers or classroom staff so you propose cutting teacher pay and ask teachers to contribute more for their benefits. Seems like a good deal to me. Teachers get to keep their jobs, unlike so many others in this country who have no jobs, they get to keep some good benefits, unlike so many others in this country who have little or no benefits, and kids get presumably qualified professionals teaching them in the classroom. I am at a loss to see how forcing a situation where teachers have to be fired is good for teachers or students. Sleep! Here's hoping I get a little more in the weeks to come.The blessing of helping hands.Wisdom. It's one of the few things in this world where there is no such thing as too much.Spring is coming! Have you seen how bright 5 o'clock in the evening is these days!What are you thankful for? 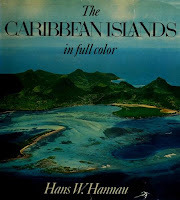 Last summer a friend gave me a copy of The Caribbean Islands in Full Color by Hans W. Hannau, published in 1972. I started reading it as I was embarking on a study of the history and culture of the region at the time. While billed as a pictorial volume I found it contained a surprising amount of historical and cultural information. The following excerpt from page 12 caught my attention when I first read it and has stayed with me since. I've added links to the text for those as curious as I was. These are just a few things that caught my eye over the last week. If you're inclined to commit murder and don't want to get caught Oklahoma is apparently the place to be. Parents Fight To Find Truth Behind Daughter's Death. Who needs an autopsy when you've got someone who should be a prime suspect telling you that it was suicide? Seriously, when was the last time you heard someone who believed in AGW say that something was NOT a sign/symptom/proof of AGW? The big storm seems to have completely missed us.Central heating.Warm blankets.Freedom.What are you thankful for?